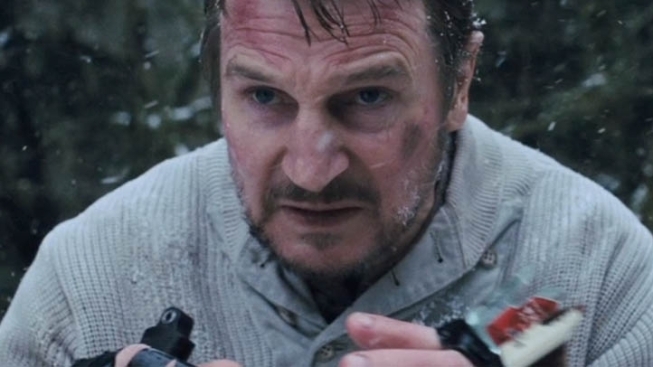 In upcoming thriller "The Grey," Liam Neeson stars as an oil rig worker who survives a plane crash only to be forced to fight for survival in the harsh Alaskan wilderness. Neeson reunites with his "A-Team" director Joe Carnahan, and the movie is due to hit theaters in January of next year. Because thanks to its first official trailer, this movie will forever be known as the one where Liam Neeson fashions Wolverine claws out of broken mini-bottles of booze and punches wolves. Once again: Broken mini-bottles of Stoli. Used to punch wolves. BY LIAM NEESON. This movie can't get here fast enough. This is going to make "Taken" look like "Love, Actually."